This post isn’t going to be about food, or sites I have visited or markets in foreign countries. Rather, this is about the kindness of strangers, and what happened to me this week gives me hope that the world has kind strangers who are willing to help. I have not told A SINGLE PERSON about this, until now. 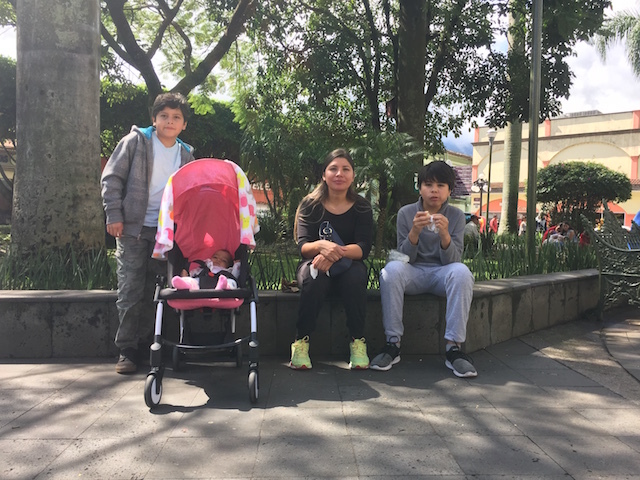 We spent the majority of October in Antigua Guatemala to visit and to volunteer — my husband recently retired and did some work with an International Planned Parenthood NGO. His experiences and what is really going on in Guatemala with respect to population growth could fill a 400-page book. More on that later, perhaps. I had my birthday at the end of October (YAY! ), the murders at the Pittsburg synagogue took place the day before I left and I was so distraught. I returned home the next day by myself. My flight went from Guatemala City to Mexico City, then on to Seattle. The 2 ½ hour layer with AeroMexico in Mexico City was pretty uneventful and I did the usual: cleared customs, refilled my water bottle, downloaded the latest version of my newspapers and a movie on my iPad, all was well. Until it wasn’t. I boarded my six-plus hour flight around dinnertime. I took out my knitting, looked at my phone to put it into Airplane mode, and I saw a voicemail and missed call. The voicemail, in broken English, said, “Hello Marilyn, this is Antonio. 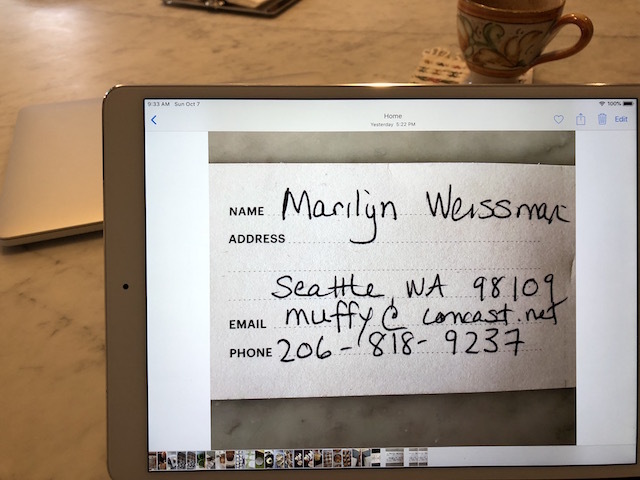 I have an iPad with your name on it…did you lose your iPad?” I had a huge hot flash, searched around and lo and behold my iPad was gone. Damn. I must have left it in the waiting area where I was reading my Kindle book. I kicked into gear, called Antonio but could only listen to his message. Another passenger listened to the Spanish recording too and confirmed what I thought it said, I kept calling, I kept getting the recording, the flight attendant said that it didn’t matter, that even if the device was brought to the gate I couldn’t get it due to security. Great. But I had hope…hope that because this man called me, he had my iPad and knew my name, my email and my phone #. I even purchased Wifi for the flight. And by the way, the worst part of this is that I had a really good book, two newspapers and two movies to keep me busy for those six plus hours. No iPad meant I got a LOT of knitting done. A few hours into the flight, I heard from Antonio. He said he had my iPad, wanted to know where I left it just to be sure he had the correct owner. I told him where I had been sitting by gate 68, and that is where he discovered my device. He was headed to Campeche, Mexico for vacation and I wrote that I would text or email him when I got home. THE SECOND MOST AMAZING PART OF THIS STORY? I read before I left that when traveling, it is smart to have my locked screen display my name, email and phone number. I took a picture of this information and set the picture for both my phone and my iPad. (Usually, I have pictures of my grandkids or a pretty Seattle picture). What brilliance. TAKE NOTE and do this when you travel. My Screen – HIGHLY RECOMMEND! But I digress. I went back and forth, Spanish translated into English and vice versa. Antonio was on vacation but spotted an international DHL office where he could ship my iPad. HALLELUJAH. I counted over 50 back and forth emails, over 20 texts trying to figure out how to make this happen and how I could reimburse him for the mailing cost. It was complicated and I won’t bore you with the details. By Wednesday, he took four taxi cabs to mail my package, I wired money through the bank which took over an hour and a lot of red tape and ta-da! You got it, Antonio. And if you are ever in Seattle, I’ll treat you to the best food ever. Gracias!! Here is a picture of Antonio’s beautiful family he sent to me. This entry was posted in uncategorized and tagged unexpected kindness of strangers. Bookmark the permalink. I love this story. Karma, baby. And a small bright light in the midst of so much darkness. First off..Happy,happy birthday to my beautiful friend ..you ! Secondly, this story brings tear of joy to my heart. Thank you so much for sharing your story. It is wonderful in so many aspects. Educational. I didn’t know about putting your name on the IPAD when traveling and inspiring too! Congrats to Wayne on his “ retirement work” . What an amazing man you are married to and yourself for the adventures in global kitchens that have taken you to faraway places these many years. P.S. We will be in Seattle in January. Thankyou, Pearl, for all your lovely comments. We don’t have our travel schedule firmed up yet for January but I”ll stay in touch and hopefully we can see each other in the flesh! I am so grateful to have known you all these years, and I miss you!! Marilyn, many years ago I left my purse on a bus in Chicago, because I had so many packages. I thought it was gone forever, and then I got a phone call from a girl who said that her grandmother had my purse and would give it to me the next day at a nearby restaurant where she worked in the kitchen. She was a cleaner, and was certainly not well-to-do. Her kindness renewed my faith in humanity! I know how you feel. Thank God for good people! Yes, you do know how it feels and I hope to pay it forward some day. If everyone tried to be kind, the world would be so different! Such a lovely experience in such ugly times. Thanks for sharing! I agree, Cathi. A pleasant surprise! Fantastic. Help me do the screensaver thing next week. Brilliant. I will. ANd you know me, and how I always think I have everything organized just perfectly. I coudln’t believe I would do such a thing. As mogher would say, all’s well that ends well. I think William Shakespeare said that, too. Heh, heh, heh.